Stanley has retained the rustic flavor of an old West mining town, with its original buildings and broad, unpaved streets. The surrounding high mountain meadows of Stanley Basin are still cattle ranchland. Today, the town is comprised of two settlements; Upper and Lower Stanley. 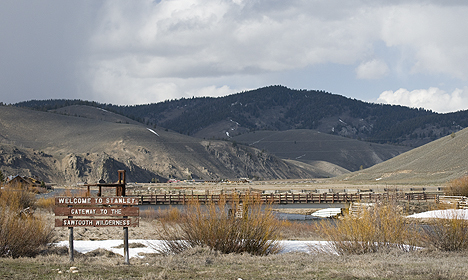 In summer, the small town swells with visitors who use Stanley as a base for exploring the Salmon River, the Sawtooth National Recreation Area, and other public lands. Popular in summer are rafting, float trips, hiking, fishing and hunting, and in winter, snowmobiling and cross-country skiing. Stanley, Idaho viewed from the south edge of town looking toward the north. GPS: N 44, 12.5924; W 114, 55.8889. Elevation: 6,269 ft and 8.22047 in, or, 1,911 m.
Game, including the valuable beaver first attracted fur trappers, but it was gold that eventually opened up the region. Stanley, established in 1890, is one of the few gold era towns remaining, and the basin is littered with ghost towns, such as Vienna on Smiley Creek, Sawtooth City in Beaver, and Custer and Bonanza on the Yankee Fork of the Salmon River. The town takes its name from the surrounding basin, itself named for Captain John Stanley, a Civil War veteran. He was leading a party of prospectors who passed through the basin on their way to Idaho City. The party found a small amount of placer gold, and Stanley didn't return but one of the party, A.P. Challis, did and mined around Stanley for many summers. Go Northwest! travel guide provides you with all the visitor information you need to when planning a trip to Stanley. Just use the navigation links in the left hand column or the drop down menu at the top of the page to find where to accommodations and lodging, restaurants and dining, activities and recreation, along with attractions and points of interest.